Bloom Boosters are integral in maximizing flower production in plants. 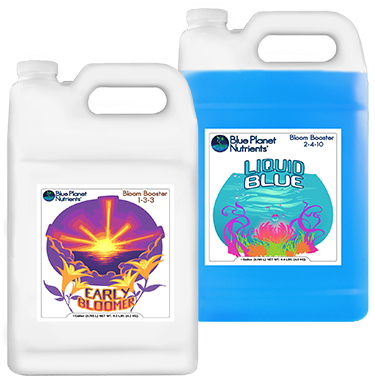 Blue Planet Nutrients has created 2 bloom boosters designed to maximize yield and fruit/flower size, Early Bloomer and Liquid Blue. 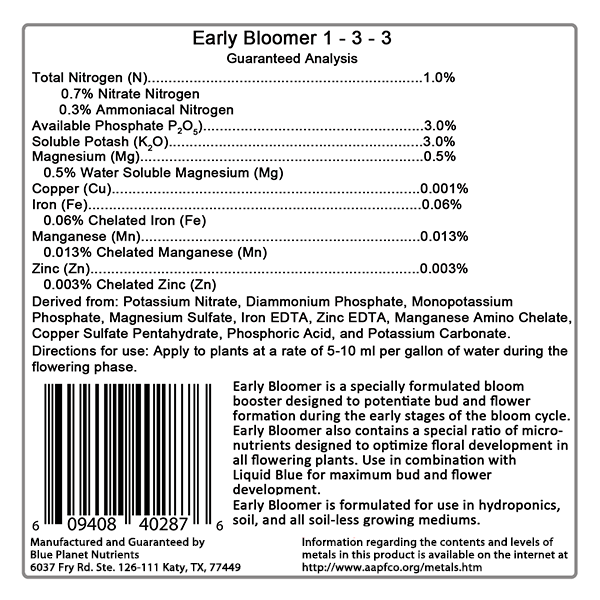 Early Bloomer is designed to maximize the early development of buds by providing plants with a 2:1 of ratio of elemental potassium to elemental phosphorus. 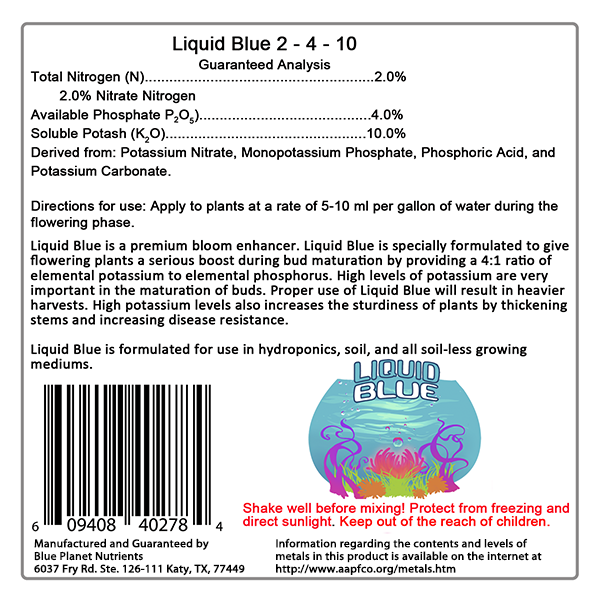 Liquid Blue is designed to maximize the fattening and hardening of buds by providing plants with a 4:1 of ratio of elemental potassium to elemental phosphorus. There is much speculation on what is the proper ratio of Phosphorus (P) and Potassium (K) for a bloom booster to maximize bud and flower growth. From our research, we have found that plants require a bloom booster with a 2:1 of ratio of elemental potassium to elemental phosphorus during the first few weeks of the flower phase. After the first half of flower phase, plants should then should be transitioned to a bloom booster with a 4:1 of ratio of elemental potassium to elemental phosphorus ratio to plump and harden buds. Let me explain: The transition from vegetative growth to flowering is one of the most essential periods in a plant's ontogenesis. When a plant is transitioning from vegetative growth to the flowering phase, the initial formation of flower primordia is a massive energy consuming process. In plants, ATP (adosine triphosphate) is the key energy transfer molecule. Elevated levels of phosphorus are required for the excess production of energy rich ATP. The flowering process places a huge demand for energy on plants and therefore, adequate phosphorus is essential for the process of energy production and transfer. 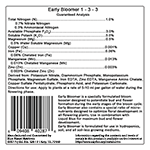 Early Bloomer provides the optimum levels of phosphorus necessary for optimum bud site development. One problem with providing higher levels of phosphorus is that excess phosphorus can cause a decrease in uptake of zinc, iron and copper, which can potentially start a chain reaction of other macro and micro nutrient deficiencies. Because of this, Early Bloomer is fortified with zinc, chelated iron, and copper in just the correct amounts. Copper has also been proven to significantly enhance the size and yield of buds and flowers and Early Bloomer ensures that the enough copper is available to the plant for bud and flower formation. Do you want Dense and Flavorful Buds? 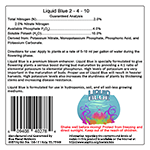 Liquid Blue is designed to maximize the fattening and hardening of buds by providing plants with a 4:1 of ratio of elemental potassium to elemental phosphorus. 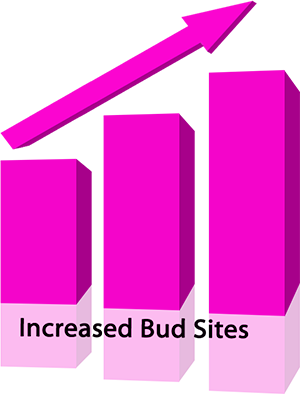 Once a plant has fully transitioned into the flowering phase, and bud site development is maximized, a bloom booster with a 4:1 of ratio of elemental potassium to elemental phosphorus is needed to produce more structurally sound buds (dense bud formation throughout the calyx cluster). This is where Liquid Blue comes into play. After the first half of the flower phase, growers should begin transitioning to a lower phosphorus (P) / higher potassium (K) bloom booster. As plants transition from early flower to late flower phase, phosphorus uptake rapidly decreases as flowers begin to mature. Elevated levels of phosphorus are no longer needed to maximize development of bud sites but elevated levels of potassium is necessary to plump and harden buds and maximize the yield of flowering plants. Although potassium does not form a structural part of any plant component or compound, It is required for various metabolic activities and physiological functions. It is agreed throughout the plant science community that elevated levels of potassium are unequivocally required for maximum yield of flowering plants.